Non profit arts organization Central Florida Community Arts (CFCArts) proudly presents Swamped, as performed by members of the Beginners Program (Kindergarten through 2nd grade) of their Children and Youth Arts program. The swamp is all a-buzz with party preparations galore! Naturally, the turtles are running late, and Bully the Frog is being a bully. The frogs have learned a new dance they want to share. The tadpoles are growing appendages (yikes!) and the dragonfly larvae need encouragement to spread their wings and fly. Lessons of friendship, tolerance, courage to face the future, and more, abound! 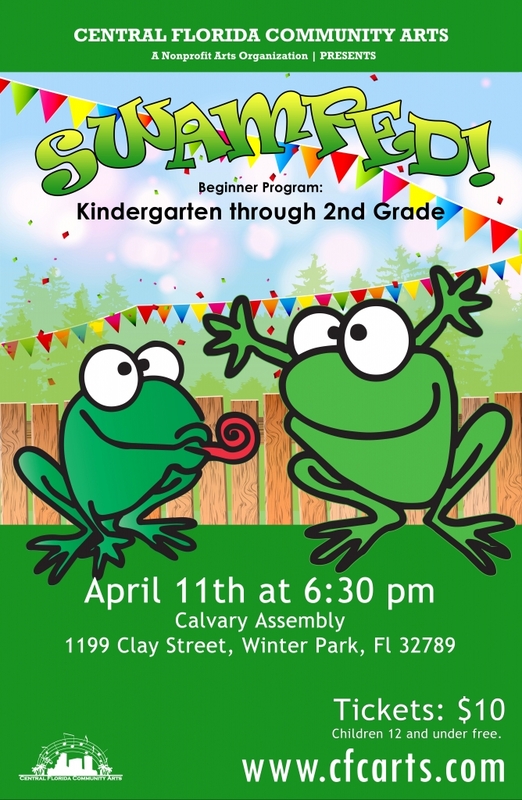 Swamped will be performed at Calvary Assembly, 1199 Clay Street, Winter Park, FL 32789. at 6:30pm on Saturday, April 11. General Admission tickets are $10 each, and children age 12 and under will be admitted for free.